POD HD Pro X, Guitar Amp Simulation Rack from Line 6 in the POD Pro series. Line 6 updates its rackable guitar amp and effect simulator and launches today the POD HD Pro X. Just like the recent POD HD500X, the POD HD Pro X benefits from faster process calculation and boosted DSP with dynamic allocation and more flexible routing options so that users will be able to create more complex signal chains. The POD HD Pro X gives users the ability to create two signal chains, with many routing options, and insert a stereo effect loop anywhere in the signal chain. Regarding the sounds, the module features the same 30 HD amp modelings as in the previous version, and 100+ stomp effect emulations, with various distortions, delays, filters, modulations, reverbs and more. You can use up to 8 effects simultaneously and choose between several different cabs and microphones for the wildest sonic experimentations. The POD HD Pro X ships with 8 set lists featuring 64 factory presets and you can save and store 512 user presets. Other tools include a 48-second looper and a chromatic tuner. The connection panel include a 1/4" stereo line input, a stereo effect loop with Line/Stomp level switch, XLR and Jack stereo outputs with Line/Amp output level switch and Ground Lift, a 1/4" Dry output, AES/EBU L6 Link I/O, a Variax connection for the Line 6 Variax guitars, MIDI In and Out/Thru 5-pin DIN, digital S/PDIF I/O and a USB 2.0 port. Line 6 adds that you can use an optional FBV Shortboard MKII foot controller sold separately. 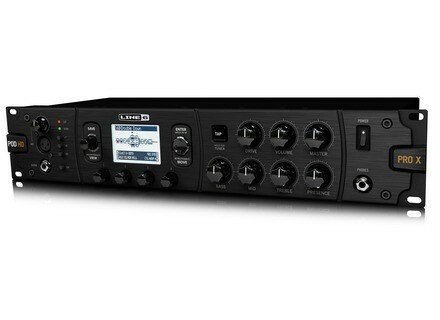 The Line 6 POD HD Pro X ships with a software editor/librarian for Mac and PC. No information regarding the retail price. Visit line6.com/podhdprox/ for more. DigiTech introduces the Element pedals DigiTech will launch in October two new Element and Element XP multi-effect pedals for guitar. Vox Mark III and Mark V reissues The Vox Mark III and Mark V electric guitar reissues will hit Europe in november. Vigier Shawn Lane Signature Limited Edition Vigier commemorates the 10th anniversary of Shaw Lane's death with a special edition of the artist's Excalibur Signature guitar limited to 10 copies.